The GeForce GTX 1080 became the new consumer graphics chief when fully unveiled on May 17. Priced at a cool $699 for the Founders Edition, Nvidia's cohort of add-in card (AIC) partners have now been given permission to launch their custom-cooled cards that are available on pre-order. Our focus on May 17 was, quite understandably, the GTX 1080, but astute readers will have noticed that Nvidia boss, Jen-Hsun Huang, also made mention of a second card based on the new Pascal architecture. That card is the GeForce GTX 1070, available in reference/Founders form on June 10 for a more palatable $449. The AICs will be allowed to produce their own cards a week or so later, following on from the timetable set by the GTX 1080. Best of all, price should drop to a starting $379. The reason you should care about GTX 1070 is that it promises around 75 per cent of the GTX 1080's performance for about 65 per cent of the money, and with even lower power consumption to boot. Think of it as GTX 980 Ti -like perf for less money. Let's examine what Nvidia has done in order to cleave the GTX 1070 from the GTX 1080 die. You'll likely remember this slide from the original GTX 1080 review. 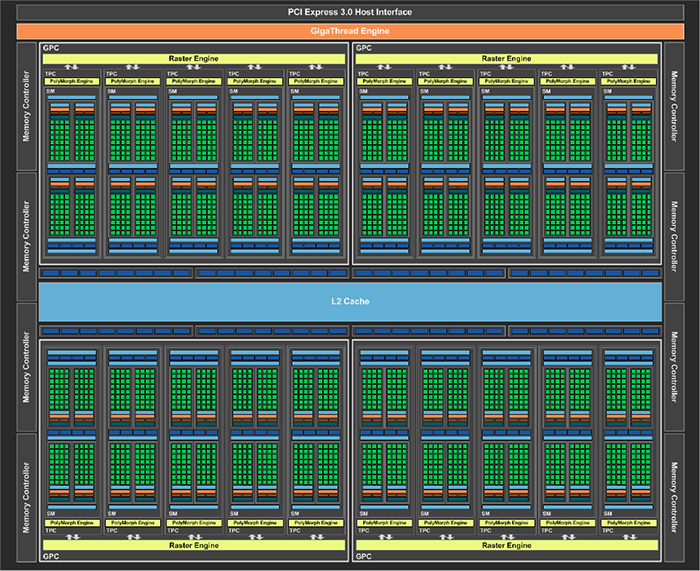 The high-level shot shows the full Pascal GP104 architecture, as used by the range-topping card, so Nvidia has to make snips somewhere to effectively stall and segment performance. And for those that don't know, Nvidia cannot readily and quickly make separate, distinct silicon for each GPU; such an approach would be too expensive. The big clue in what Nvidia has done rests with the number of shaders present. GTX 1080 has the full 2,560, split over 20 SM units arranged in four GPC groups of five. GTX 1070, meanwhile, has 1,920, meaning that five SMs, or one GPC, is deactivated. There's a commensurate reduction of texturing units, some cache, etc., as each part is inextricably linked in with the SM, though back-end ROPs remain the same. And, really, that's it from a core point of view. The other change is dropping new-fangled GDDR5X memory and replacing it with regular GDDR5. We alluded to the fact that Nvidia's learning when co-developing GDDR5X with Micron would filter on down to what is considered standard memory. The fruit of that labour is the GDDR5 speed being raised from a last-generation default 7Gbps to 8Gbps here. It's needed, too, as the GTX 1070's narrow 256-bit bus cannot produce heaps of bandwidth associated with top-tier cards. Helping in this regard is improved memory-compression technology on the Pascal GPU. So one fewer GPC unit and slower memory represent the performance trade-offs by dropping down to the GTX 1070. Nvidia wants to increase the yield of this GPU per given wafer than GTX 1080. One method of doing that is to drop the frequencies, enabling those chips that don't quite reach the GTX 1080 standard to be repurposed here. Accordingly, the core speed is reduced marginally, though the average boost speed is verging on the GTX 1080's. GTX 1070 loses a tad more than one-quarter of the shading power of its bigger brother. There's also a slight deficit in memory bandwidth. Our best guess, before seeing the benchmarks (honest), is that it's primed to challenge incumbent GTX 980 Ti in the performance stakes, knowing what we do about the GTX 1080, though with a lot lower power consumption than the last-gen champ.